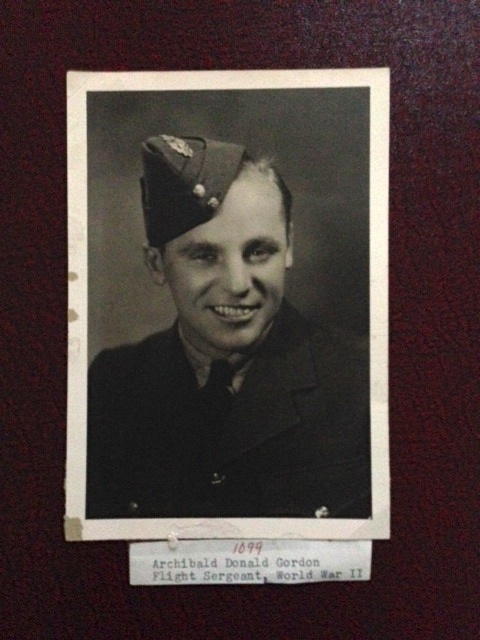 On April 6, 1943, a Halifax bomber with 405 Squadron of the Royal Canadian Air Force, in which my great uncle, Sergeant Archibald Don Gordon, was flight engineer, was shot down over the Bay of Biscay off the coast of France. The second youngest of a large farm family living in northern Alberta, he was a bright and cheerful chap adored by everyone. He was closest in age to my grandmother and they were fast friends. He was in his early 20s when he left for war. He did his duty for his country and paid the ultimate price. Sergeant Gordon’s body was recovered and is buried in the war cemetery in Pornic, France. This entry was posted in Canada, History, Life, Reflections, Uncategorized and tagged Aimwell CreativeWorks, black and white, Dorothy Chiotti, flowers, Lest We Forget, Love, military, Photography, RCAF, Remembrance Day, WWII. Bookmark the permalink.